Dr. Tabor was out of town this week so we got to see Dr. Bleich again. I really like her and as it turns out, she was a resident with our reproductive endocrinologist, which I thought was neat. Today, the babies movements and reactivity were recorded. Our tech started with Rylin then moved to Harper and Sydney and saved Mason for the end. 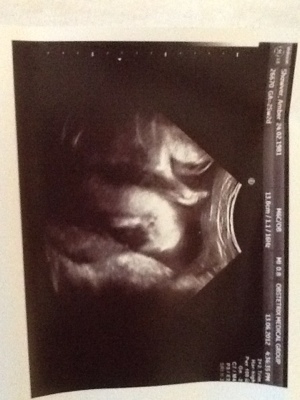 Apparently Mason is an aspiring kick boxer….his feet or hands were poking all of his siblings at one time or another! By the time he was checked, he decided to take a nap. Gah! I guess all the kicking and punching tuckered him out. I mentioned the navel bruising and learned that Sydney and Harper have their little bums situated right under my navel. They have been booty bumping me!!! Maybe they are future disco aficionados…. Oh, and Mason is sitting right under my ribs, which explains my constant rib discomfort. I can imagine him kick boxing my ribs or doing chin ups on them. I will take the discomfort any day, they are always worth it! Of course, Sydney’s fluids are still low, but they are stable. I will take that! Dr. Bleich said that she does have enough fluid, which made me feel a little better. The pressure on her umbilical cord is also stable. She just needs close monitoring. We weren’t scheduled for a growth scan, but sweet talked our ultrasound tech into measuring Sydney. She is still small, but has grown. Again, more relief for me. Thankfully, my vitals continue to be good. As long as Sydney is stable we can avoid delivery, and hospitalization. Rylin and Harper had average fluid levels and Mason had some extra. Here is to making it at least 28 weeks. Ps…we have some updated pics in the photo gallery. Here is Mason kicking Rylin! Looking great, Amber! Glad you were able to sweet talk a growth scan in, we plan to do that too!!! Will continue to pray for you and the babies, but sounds like all is looking really good! Having them look at just her gave me a piece of mind. I sure hope you can get one too snd that baby c is growing! Hi Amber, I just came to your blog from my cousin-in-law Jana Kitts, who told me that you work with her mother-in-law Ruth. I just wanted to introduce myself as a fellow MoM of 16 month old triplets. We live in Richardson so we are close enough, that I could come by if you need someone to come keep you company on one of those long days of bed rest (I was on home bed rest for 1 month and in the hospital for another month before the babies were born…I know how miserable it can be)! I’d be so happy to get to know another mom of higher order multiples in person! Reading your blog reminds me so much of the time that I was pregnant. If you’re bored and want some reading material I have almost two years worth of posts about pregnancy and how much fun multiples are! 🙂 http://www.threeleggedrace.us Feel free to send me an email anytime. Hi Cristina! It would be great to know another MoM in person! And I am sure you have some good tips. I will have to check your blog out, I love to read about others experiences. It helps normalize some of it, and gives warning of what may come. Oh, Ruth works with my mom so I haven’t met her in person. However she has been a huge supporter and tells mom about her niece who has triplets.